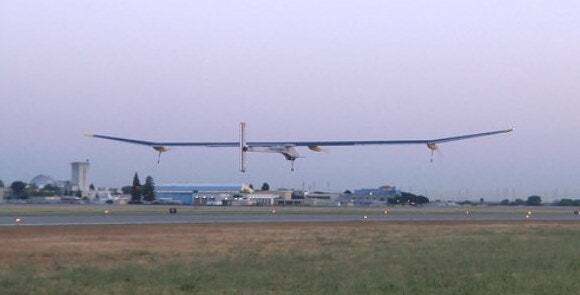 A one-of-a-kind aircraft powered solely by solar energy took to the skies above Silicon Valley early Friday morning, May 3, on the first leg of a planned trip across the U.S. The aircraft, called Solar Impulse, has the wingspan of a jumbo jet but weighs the same as a small passenger car and can theoretically fly forever. 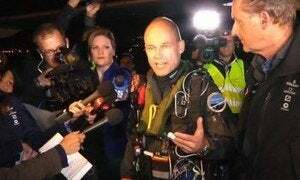 Bertrand Piccard, pilot of Solar Impulse, speaks to press shortly before takeoff. At a little after 6 a.m., in front of a small crowd of spectators and a row of media cameras, the propellers on the aircraft revved and it began to move along the runway at Moffett Field in Mountain View, California. Within a few seconds it was airborne, climbing slowly away from its home for the last two months and, the team hopes, into another page of aviation history. The Solar Impulse plane travels along the runway at Moffett Field in Mountain View, with the airfield’s famous Hangar One in the background. The secret to its light weight is a fuselage made from carbon fiber sheets three times lighter than paper. The solar cells that cover the tops of its expansive wings are thin, at just 135 microns, and it makes incredibly efficient use of the power it generates. Losses in the plane’s motors amount to roughly 6 percent, versus around 70 percent in conventional motors, according to the project team. Solar Impulse has already set several aviation milestones in Europe, including the first ever solar-powered night flight in 2010, the first international solar flight in 2011 and the first intercontinental solar flight in 2012. It also holds five world records, including one for duration: an impressive 26 hours, 10 minutes and 19 seconds. The journey that began May 3 is scheduled to end in New York sometime in July. The first leg, at a pace equivalent to about 70 kilometers per hour, takes it from Moffett Field in Silicon Valley to Phoenix, Arizona, where it is scheduled to land at around 1 a.m. Saturday, May 4. Further flights will go to Dallas, St. Louis, Washington D.C., and New York. The Solar Impulse sits on the runway at Moffett Field shortly before takeoff. The trip isn’t about speed. After all, it would be quicker to drive to Phoenix than fly in Solar Impulse. Piccard, who previously completed an around-the-world flight in a hot air balloon, is sharing cockpit duty with André Borschberg, a former Swiss Air Force pilot and graduate of MIT. The two will be piloting the different legs of the journey between them. By the numbers, the Solar Impulse has a 63 meter wingspan, is 22 meters long and just over 6 meters high. It weighs 1,600 kilograms and its four engines are powered by batteries that are charged by 11,628 solar cells. Its take off speed is a fairly leisurely 44 kilometers per hour and its cruising altitude is 8,500 meters, or 27,900 feet. Updated at 10:30 a.m. PT with more information on the flight.